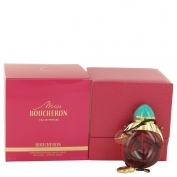 With this new floral fragrance Boucheron has for the first time particularly targeted women 25-35 of age. Vividly colored traditional bottle looks like a toy, and the visual campaign is based the story of Alice in Wonderland. The floral bouquet was created by Anne Flipo and Dominique Ropion combining the notes of bergamot, pink pepper, violet and rose, resting on the base of white deer leather, cedar wood and musk.